Since we don't have the space for a compost bin and I don't have the time (or the inclination, if I am totally honest) to maintain a worm farm, I wanted to find an alternative to dispose of our food scraps and vegetable peelings rather than just throwing them into the rubbish bin. I was so happy when I found the Bokashi Bucket. The Bokashi Bucket, like other forms of composting, turn your food waste from rubbish into a rich soil conditioner. 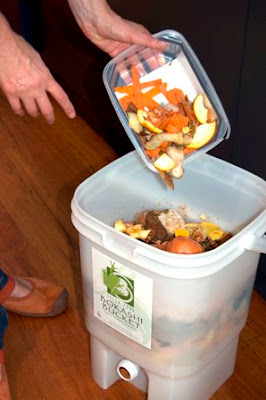 Unlike other forms of composting that rely on the waste decaying, the Bokashi Bucket uses a fermentation process, which means that there is no smell (a big concern when you are having the bucket inside the kitchen) and that you can add in food scraps like meat (raw and cooked) that you couldn't with regular methods. The system is really easily to use. All you need is a specially designed bucket (there are instructions to DIY on the net if you don't want to buy one) and Bokashi mix, a special mix of rice bran and microorganisms. Add your waste to the bucket, top with some of the mix, and cover. Repeat. That is it. When the bucket is full, (which takes ages, by the way, since the process "shrinks" the waste) you bury it in your garden or pot where it will finish decomposing and add valuable nutrients to your plants. If you also have a regular compost heap, you can add it that as well. The Bucket also produces a liquid which you drain off from the tap, dilute and use as a fertiliser on your garden in the same way as compost tea or worm tea. If you have too much juice, it is great to pour down the drain, as it is apparently very good for our water ways. This system is so easy to use, inexpensive to buy (or make), and takes up hardly any room, so I recommend it for everyone. Make sure you check out Bokashi Man. His blog is devoted to Bokashi, and includes instructions on making your own Bokashi mix and buckets.